In London we're spoilt with how much public art we have on display. We have the Broadgate art trail, the Line and the annual Sculpture in the City. Not to mention the many solo sculptures in squares and parks. But what exactly is the role of public art? Though it often goes unnoticed, it injects much-needed culture into a city, and gets people engaging with art who perhaps otherwise wouldn't. Somerset House's new exhibition — Out There: Our Post-War Public Art — delves into this vital part of the arts, covering everything from the Hepworth on the side of the John Lewis building, through to the modern day labyrinths that Mark Wallinger has placed in every Underground station. There are some fabulous sculptures on display, like a towering Lynn Chadwick and a pair of meat porters whose bodies seem to merge with the carcass they're carrying. Artworks also symbolise community spirit: two neighbours meld into one, and a tower rises up — ultimately held up by people. 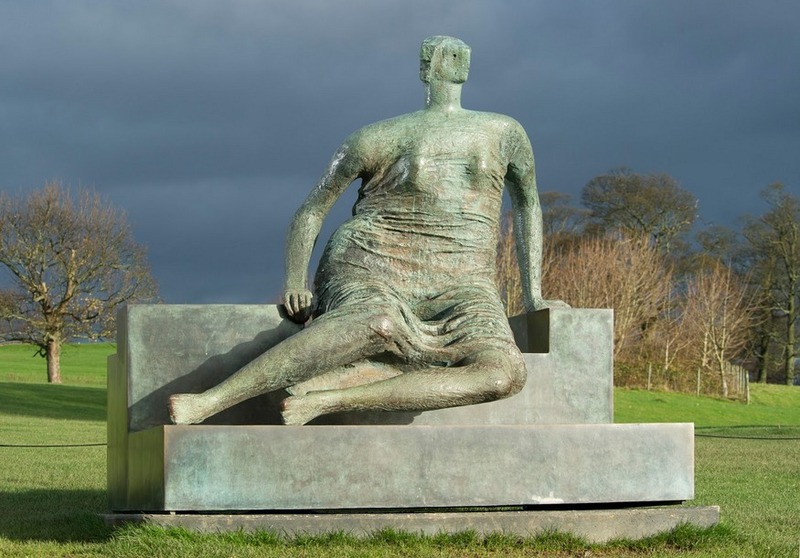 We see how much the public cares about public art too: there are videos of protests to save Henry Moore's sculpture known as Old Flo. As this is an indoor exhibition there aren't too many large sculptures; we have to rely on photographs and maquettes, and these lack the impact of the full-scale versions. FE McWilliam's Cain and Abel would look much more dramatic at full whack. Another hold-up: one of the great things about public art is it's free to see and interact with. We know that exhibitions cost money to organise, but the admission charge is at odds with the nature of the show to pay for entry. The exhibition ends by showing us all the public works that have been sold, lost or destroyed. It's sad to see how much is no longer visible, but this is contrasted by listing all those that have now been awarded heritage status so they can be preserved for future generations. 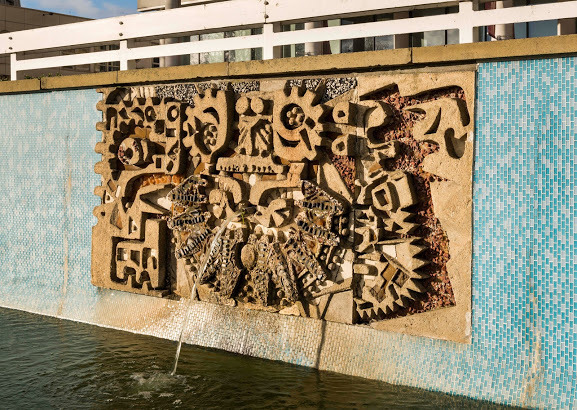 A relief by William Mitchell made for the Water Gardens in Harlow, Essex. © Historic England. Out There: Our Post-War Public Art is on at Somerset House until 10 April. Tickets are £6.50, concessions £5. The exhibition has been organised by Historic England.